The above photo shows what is perhaps one of the worst games of Tetris ever played. 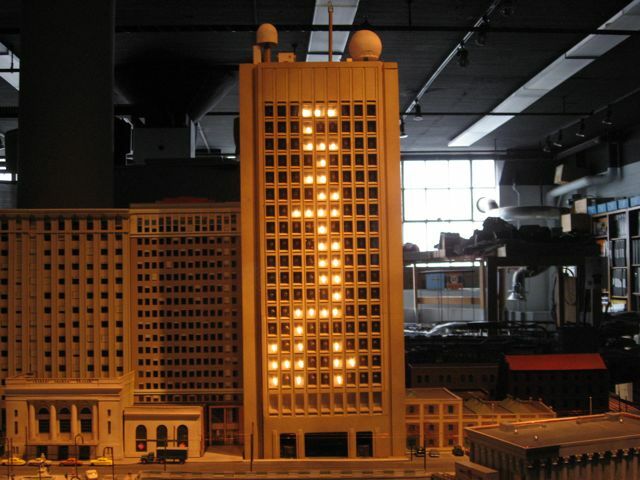 In my defence, the point wasn’t so much to play, but to take a photo of the great setup the Tech Model Railroad Club had set up next to the MIT museum, complete with a replica of the Green Building that you can play Tetris on. Truly the nerdiest place on earth. Tetris is essentially a bricklaying game on a timer. You’re given tiles and you have to rotate them so that you make “lines” at the bottom, which promptly disappear when complete. If there are any spaces left in between, they remain – (for many examples, just look above). What makes Tetris hard is the arrangement of the different shapes. You often have to rotate them in order to get them to stack correctly. If you want to make the game absurdly easy, just make it such that every tile looks like the one on the left. Or difficult, to the piece on the right. You’ll notice something – the simpler the pieces are, the easier they are to stack together, which provides a tighter fit with fewer spaces. Here, by putting a kink in the block, we make them harder to stack. What’s this got to do with chemistry? When compounds freeze, the process is a lot like stacking bricks. The more symmetrical the molecules are, the easier it will be and the fewer spaces there will be between the molecules. Fewer spaces = better stacking. Hence, when you compare hexane to its structural isomer, 2-methylpentane, hexane has a much higher melting point due to the regular arrangement of its structure. Better stacking, higher melting point. Case closed. Right? Not quite. It’s also about surface area. It’s a nice story: branching decreases melting point and boiling point. But it gets more complicated. It looks like as we increase branching, we’re increasing melting point and decreasing boiling point. What’s going on? Treat the n-hydrocarbon as a special case, and ignore it for the time being. 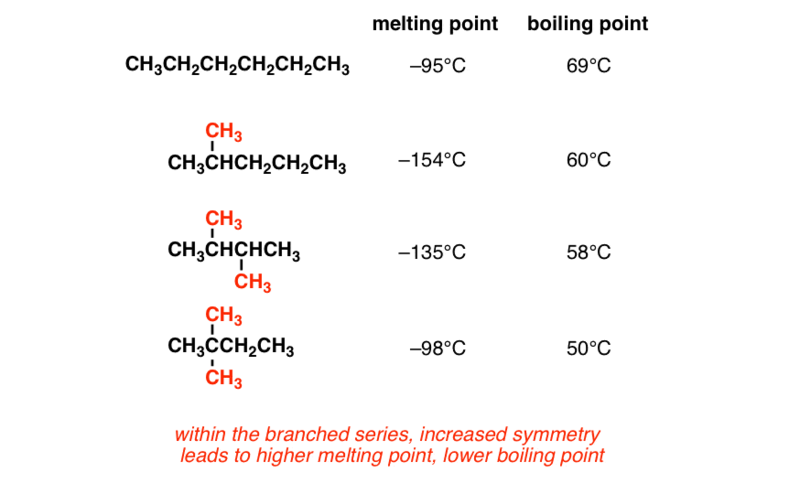 Starting with the simplest branched compound, as you increase branching, you will increase the melting point, but decrease the boiling point. Why? Going from “branched” to “highly branched” makes a molecule more compact and sphere-like. As the surface area of the molecule decreases (remember that spheres have the lowest surface area/volume ratio of any shape) they will become more compact and thus easier to pack. This explains the melting point phenomenon. Boiling point is related to the forces between molecules, which in the case of hydrocarbons is Van Der Waals interactions. If you’ve ever seen microscope images of a gecko’s feet – which allow it to climb walls – you’ll see that there is no adhesive but the pads contain a tremendous amount of surface area. It’s all about the Van der Waals interactions. As we decrease surface area, we are going to decrease intermolecular Van Der Waals interaction and therefore decrease boiling point. linear versus branched —> higher melting/boiling points due to better stacking and surface area contact. highly branched vs. branched —>more sphere-like – -> lower surface area —> lower boiling point. If this all seems rather ambiguous, contradictory, and imprecise, well, you have a point. It’s not a straightforward topic. As a final example, I give you 2,2,3,3,-tetramethylbutane. An isomer of isooctane (gasoline) with melting point 95 °C. Further proof, as if more was needed, that predicting melting/boiling points from chemical structures can be a fool’s errand. Hi I have one question , between a lineal saturated hydrocarbon and unsaturated hydrocarbon (double bond or triple bond) which one has higher boiling point ? I can not decide between c and d ? Well, the first answer must be strictly based on molecular weights. If the molecular weights are same, then I don’t know! 2nd answer would be d as it is the least polar compound. thank you for your explanation, this helped me understand it quickly. I am an ohio state student getting ready to take the MCAT. Thanks! Good luck, feel free to ask anything else! Thank you so much. I was wondering if you hadn’t will have a post on why melting and boiling point for alkane and alkene were different the way they were. Because I expected alkene to have higher melting point due to the double bond strength. Thank you! You’re welcome! It’s a confusing subject, glad you found it helpful! Jen – the double bond strength has NOTHING to do with boiling or melting point because the covalent bonds holding the molecule together internally do not break during a phase change. It is only the intermolecular attractions that are broken – a common mistake many students make. Thanks for your highly organized explain with tetris! But I have one question that why symmetry affects m.p of a compound but not its b.p? I really want to kbow about them. Plz email me asap! Thank You so much! The example you gave to make us understand was very effective. I am an Indian student preparing for IIT JEE entrance. So i need all the concepts crisp and clear. Thank you for your Help! Because symmetery is useless for liquids. We talk about symmetry only in solids as solids have definite arrangement of atoms. In liquids, the symmetry is useless as all molecules are in random motion within the liquid. Hence symmetry is absent in liquids, so bp is not affected by symmetry while mp is. Based on your example given (which was explained very nicely) we would expect n-pentane to have a hight melting point then neopentane, but that its just the opposite. So are the alkanes that make an almost “circle” like compound (such as neopentane) gonna have a higher MP then there straight chain isomer? Or is this a special case based off the the fact that neopentane has a lower density and much lower entropy fusion then n-pentane. Thank you for your help, know these stuff is an MCAT favorite. Thanks for this entertaining and insightful website. I think that this is how organic should be taught. I like the way that you use analogies, life and other things to present the material. Communication is the key to understanding science. Many students fail because they simply don’t understand the language. Thanks for realizing that. I believe that we think alike on many levels. I think it’s because of the last point. Methane is more spherical in shape so can pack more tightly, increasing the mp. between co2 and propane which one have high melting point and why? Those are completely different molecules. It’s hard to rationalize their different melting points because multiple variables are changing. I have a question; is it possible to add up two melting points of different substances, for instance: a solution (500ml) with a meltingpoint of 20C + a solution with melting point of 150C (10grams). i suppose that at a temperature of 30-50C will be good for this 10grams to dissolve completely ?? Melting point is a property of solids, not solutions – so I don’t know how to answer this question. 1) Since better packing makes MP increase ,can we say that it alters lattice energy? 2)Why dont vanderwaals forces affect melting point? Oh my god, this is such a beautifully simple explanation. I love how you guys make all of it so easy to understand. When I reached the end of the article, I was like, “Oh! That’s it?” Loved it. So glad you found it useful Saujanya!